Levik Tubul recently released an album that he has been working on for two years already. The Shlager Project features performances by some of the biggest names in Jewish chassidic music. Dedi, Lipa, Yeedle, Motti Shteinmetz, Yishai Lapidot, Dovid Gabay, Avremi Roth, Shloime Cohen, Yoni Shlomo, Levi Falkowitz, Yosef Chaim Shwekey, Gad Elbaz, and Eli Herzlich. Moshe Laufer and Mona Rosenblum, along with Eli Klein and Yitzy Berry. The background choir vocals are by Yoily Polatseckand the Zemiros Group, together with the Shir V’Shevach Boys Choir lead by Chaim Fligman. Levik lives in France and directs the Israeli music website Shlager from there. He is considered one of the top graphic artists for album covers and posters in Jewish music. The Shlager Project is being released with a single off the album featuring Yeedle. The song was composed by both Levik and Eli Klein, arranged by Moshe Laufer, and features vocals by Yeedle and his son, Chaim Eliezer Werdyger. 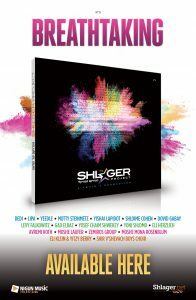 The Shalger Project is in stores now and available for digital download on all platforms and is available in the US through Nigun Music.